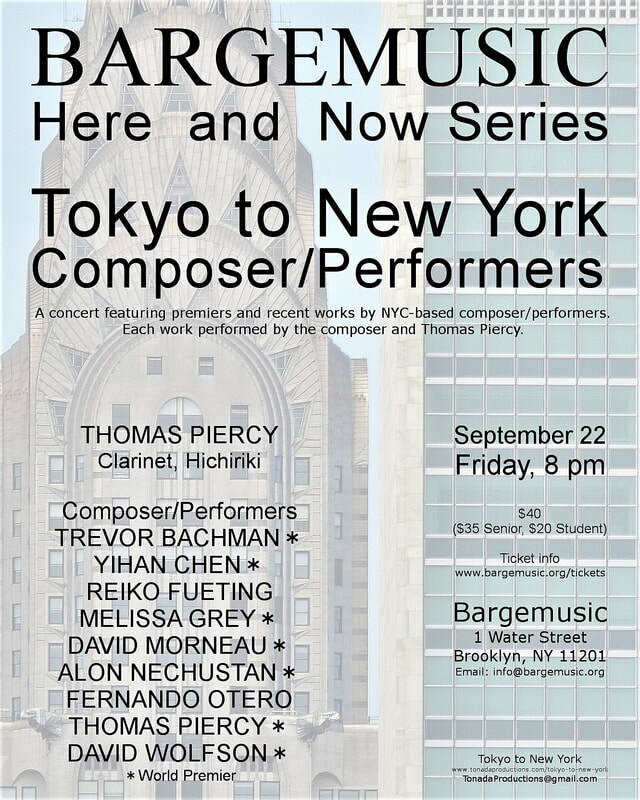 "Tokyo to New York" at Bargemusic. A concert featuring premiers and recent works of NYC-based composer/performers with clarinetist/hichiriki player Thomas Piercy performing each work with the composer. "Tokyo to New York” celebrates the connections between Tokyo and New York City with a series of concerts in Tokyo and New York. This concert will feature works of NYC-based composer/performers with clarinetist/hichiriki player Thomas Piercy performing each work with the composer. The concert features a wide variety of styles of music - from abstract contemporary classical to minimalism, from Broadway influenced pieces to nuevo tango. The composer/perfomers come from all walks of life and experience: from university students to university professors; from self-taught composers to composers with Ph.Ds; from emerging composers to composers that have won such prominent awards as the Latin Grammy Award. Since 2012, “Tokyo to New York” has performed over 70 world premiers and numerous Japan and United States Premiers.